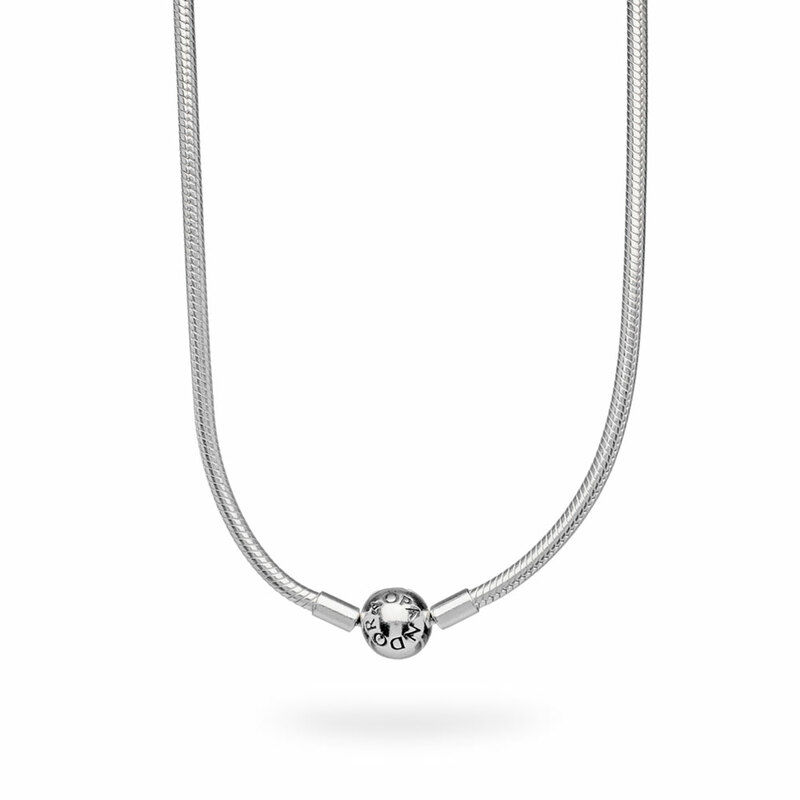 Sleek and elegant in appearance, this smooth snake-chain necklace can be worn on its own or with your personal selection of treasured charms. It is finished with a ball clasp decorated with the PANDORA logo. To create a charm design that is fixed in place and will not move, style your necklace with dazzling silicone-based clips. Available online or in-store. PANDORA MOMENTS Silver Necklace is rated 4.7 out of 5 by 43. Rated 5 out of 5 by JennieC from Beautiful! My husband bought this for me as an anniversary gift. What a perfect gift it is to add to my collection. Sturdy necklace. I got the 17.7inch/45cm. I love it! Also received the jewelry box. Beautiful, better than I expected! Rated 3 out of 5 by Karkar from Pandora chain High quality. Longest length still not long enough imo. Wish it came in 24 and 30 inches. Rated 5 out of 5 by PattyPoppy from Love Love Love it! The Pandora necklace was just what I was looking for to display and wear my many charms without the weight of the bracelet on my wrist. Rated 5 out of 5 by Mona Lisa from Beautiful Love the quality of the merchandise the chain is heavy and makes a bold statement. Rated 5 out of 5 by Amy1978 from wonderful purchase My mom bought the 19 inch size for me for my birthday last year- I love it so much! I wear it almost every day! I recently bought the 16 inch size so I could layer the chains. I couldn’t be happier with the quality! Thank you, Pandora for a beautiful product. Rated 5 out of 5 by CBanz from Beautiful Necklace I love my new necklace. I was given the mesh bangle bracelet as a Christmas gift, and now I'm addicted to Pandora. I thought the necklace would match nicely with my new collection and I was right.